The Audi e-tron joins an increasing number of electric luxury SUVs. The Audi e-tron may easily be dismissed as the electric version of the recently unveiled Q3 compact SUV, what lies underneath the familiar body is a powertrain that will set forth a new era of electric vehicles for the brand with four rings. While Audi says that the e-tron is their first production EV, it must be remembered that the Audi R8 e-tron electric supercar was sold for a limited time, with 100 units sold in Europe during its lifetime. Nevertheless, the e-tron is Audi’s first dedicated EV, and is aimed squarely at the Mercedes-Benz EQC, Jaguar I-Pace, and Tesla Model X. 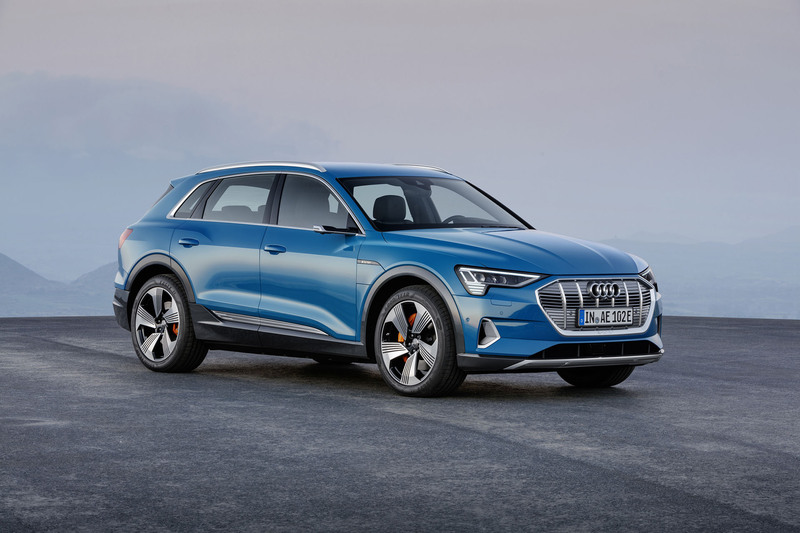 On the outside, the Audi e-tron borrows numerous styling cues from its bigger brother, the Audi Q8 flagship SUV, as well as the recently launched Q3 compact SUV. Despite being an electric car, the e-tron still features a grille with vertical bars wrapped in an octagonal Singleframe design. Matrix LED headlights flank the car’s front grille, while a satin chrome finish surrounds the grille. The rear, meanwhile, features an LED tail light design that runs along the car’s width. First Edition models receive 21-inch wheels, as well as orange brake calipers. At 4,900 mm long, 1,930 mm wide, and 1,666 mm tall, the Audi e-tron is slightly wider and slightly longer than most of Audi’s compact SUVs. The e-tron shares the same basic interior architecture as the Q3. All variants are equipped as standard with Audi’s Virtual Cockpit digital instrument cluster, which is a 12.3-inch screen that replaces the analog gauges. Working together with the Virtual Cockpit is Audi’s MMI infotainment system, which is the same touch-screen based version from the Audi A8 and Q8 flagships. Highlighting the interior are some design details that are unique to the e-tron, such as orange details that mimic the orange brake calipers for the First Edition models, as well as Audi’s first ever Virtual Mirrors. Just like what Lexus has done for the ES, the Virtual Mirrors replace the traditional wing mirrors for a pair of cameras. Two LCD screens are mounted near the a-pillars, just slightly aft of the door lock switches. The Audi e-tron is the first EV to feature a 95 kWh battery pack that supports DC fast charging of up to 150 kW, allowing the vehicle to be charged to 80% in just 30 minutes. Another innovation for the e-tron includes an intelligent regenerative braking system, which allows the electric motors to recover energy from as soon as the driver releases the throttle and when then brake pedal is depressed. Audi claims that the system is responsible for as much as 30% of the e-tron’s driving range. Another benefit of this innovative regenerative braking system is that, the system tries to maximize the heat to be converted into electrical energy, enabling the brakes to stay cool, even in downhill driving. No more excuses for failed brakes due to brake fade anymore. For now, Audi has not mentioned the maximum range of the e-tron in a single charge, but with competitors hovering around the 240-250 mile mark, expect the e-tron to be within the same ballpark. The 95 kWh battery pack is responsible for providing the e-tron optimum range, and while horsepower and torque figures have not yet been released, Audi says the e-tron sprints from 0-100 kph in 5.5 seconds, all the way to a top speed of 200 kph. Power is sent through an all-wheel drive system, which can individually send power to the wheel with the most grip. For most of the time, the system defaults to rear-wheel drive in order to save energy. Drivers can select up to seven driving modes, and depending on the driving mode, the suspension has an adjustment range of 76 mm. The e-tron will drop lower to the ground if it is on a motorway, or increase its height if the e-tron is on rougher pavement.